When the College Football Playoff rankings were released last Tuesday, one-loss Notre Dame found itself among the top five, creating a stir, as the Fighting Irish were ranked higher than eight undefeated and all one-loss teams, except Alabama. The inevitable, and pointlessly early arguments about Notre Dame’s ranking soon began to bubble and squeak, ignoring the fact that these debates tend to sort themselves out organically. In the case of the Irish, a trip to Stanford’s Farm in late November will be their last game of the regular season, as it will be for the Cardinal as well. If the rankings held until then, the match-up would have been a de facto Playoff qualifier. “The winner of that game will be decided by Oregon-Stanford this weekend. If Stanford wins against Oregon, Notre Dame will beat them. If Oregon wins, Stanford will beat Notre Dame and ruin their season. “Kevin Hogan, all that guy does is win games.” – FOX’s Gus Johnson during Saturday’s broadcast. I won’t deny that I hold an intense disdain for Stanford for many reasons, but mostly it’s for the wins they pulled off against Oregon. Stanford has defeated the Ducks only four times since 1998, but each time (2001, 2009, 2012 and 2013) has been a devastating loss that kept the Ducks from a shot at the National Championship. It would be one thing if Stanford defeated Oregon with some regularity over that span, when wins by Stanford would just happen to coincide with a successful Oregon season. But that isn’t how it happens — Stanford only wins when Oregon is having a good season. Though to be fair, Oregon has had a lot of good seasons recently. Of course, Stanford doesn’t win when Oregon is 7-6, like they were in 2002 or 2006 or 5-6 in 2004. No, when Oregon loses (those four times), their records heading in were 6-0, 7-1, 10-0 and 8-0, riding win streaks of seven, seven, 13 and 10 games, respectively. Of those four Stanford wins, they never had a shot at a national title. They all had two or more regular season losses, and never really entered the National Championship discussion in a meaningful way. Austin Maloata (No. 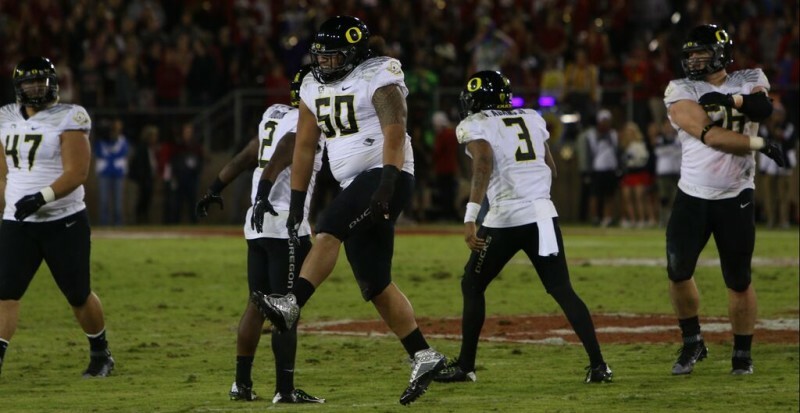 50) whoops it up as the Oregon defense celebrates a stop in the 38-36 win over Stanford. While each of those four losses were particularly crushing in their own way, nothing compares to the poorly-officiated, low-scoring, disaster of a game, that cost the 2012 Oregon team arguably one of the school’s best ever shot at the title against Notre Dame — who are one of the most susceptible big-game opponents of the BCS era. 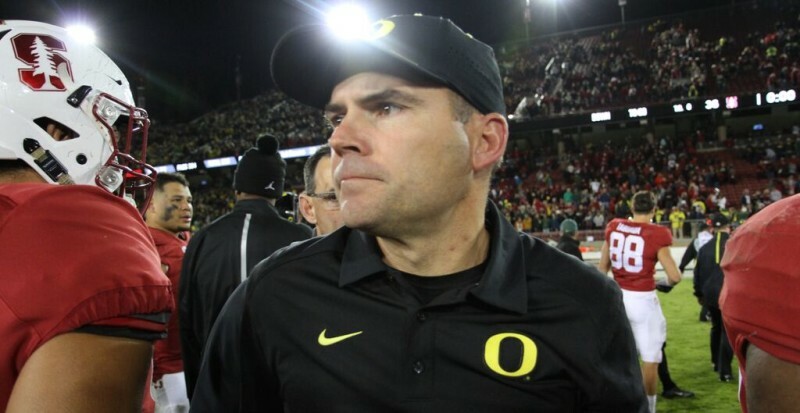 That loss will always be sour grapes to the faithful Duck fans — until Oregon win a National Championship, that is. Till then, let the hate roll on. So yeah, my passion for Stanford’s failure largely stems from that loss, but that Stanford is never in a position for Oregon to play spoiler, is cosmically unjust. The combination of the annual late-season scheduling of their matchup and the Cardinal’s cardinal proclivity to lose games, just early and often enough to shut them out of the title conversation, has provided little opportunity for the Ducks to deal retribution. 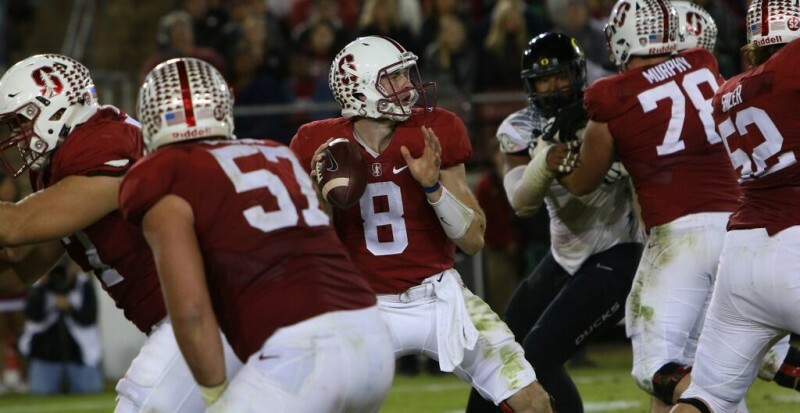 Stanford’s Kevin Hogan, captured here in a rare moment of holding onto the ball. Sure, the Cardinal were back in the discussion for a Playoff spot in the most Stanford way possible, by losing so early that designs of their elimination were dashed by the mistakes of other teams. Back in contention and with a realistic shot if they won out, they had their ducks in a row – their final three games at home, against two bowl teams in Oregon and Cal and a top-four opponent in Notre Dame, with a potential conference championship game just down the road in Santa Clara. The Cardinal were perfectly poised to earn their way into the Playoffs. 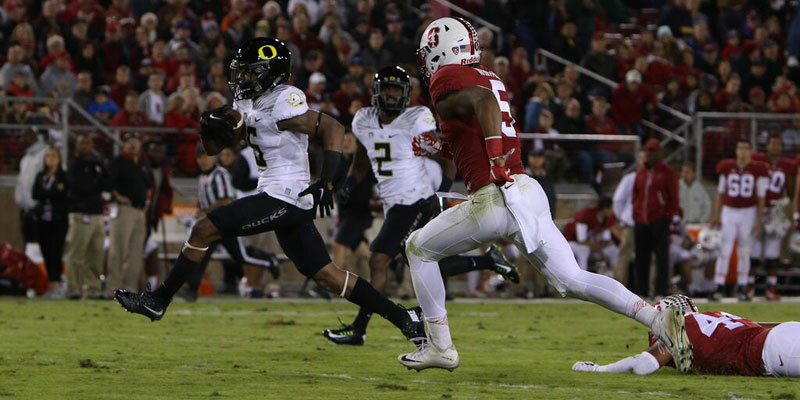 But in a delightful twist of fate and just poetry, it was Stanford, with their Playoff position on the line this year, while nothing-to-lose-Oregon got to play the role of spoiler. It was a reversal of roles from 2012: The team with something to lose, lost, and just like 2012, the victor got to spoil. Lost in all the excitement of this upset is the fact that, by winning, Oregon probably and perhaps counter-intuitively, hurt their own chances for a high- tier bowl game, and definitely ruined prosperity for the conference as a whole. Now that Stanford slides out of a potential playoff spot, it pushes every Pac-12 team down a peg. On the other hand, who cares? It was a huge win for the Ducks, their first road win over a ranked opponent by two points or less since 2001. And while no one could take away the sweet, sweet retribution for 2012, that the opportunity for revenge presented itself, begs us to redefine what this rivalry means. The higher-ranked team has now lost four of the last five games. It’s not just Stanford, coquettishly, throwing bricks at Oregon’s windows anymore, it’s a west coast Ten Year War for Pac-12 supremacy. Mark Helfrich, who has won two of the three games between them as head coaches, looks for David Shaw following Saturday’s win. From 1969 to 1978, Michigan and Ohio State engaged in what has been nicknamed “The Ten Year War,” a decade-long tug-of-war, in which the pair’s rivalry game had frequent conference and national title implications. The higher-ranked team won just four of the 10 games in the series. 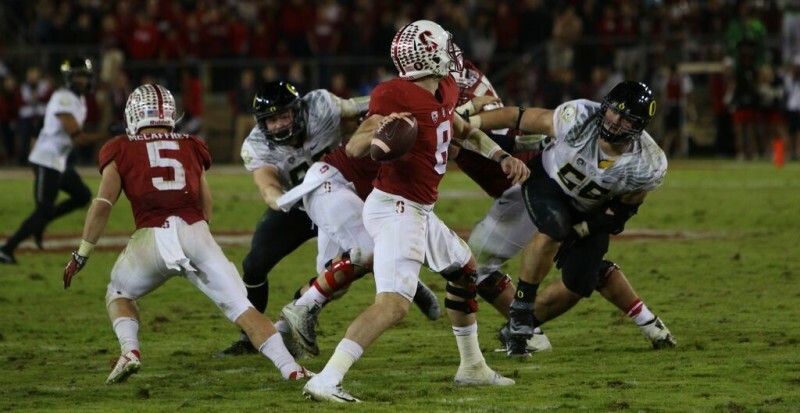 The growing rivalry between Oregon and Stanford has taken a very similar tone. In this west coast war, the higher-ranked team has won just two of the past seven games, both by Oregon, and both in seasons they played for a National Championship. The last seven years provided highly compelling, duke-it-out battles, and thrilling down-to-the-wire brawls that held eyes and compelled hearts in living rooms across America. But they must be left to the past, as set-pieces, as backstory, to the grand saga of red thunder vs green lightning, old order vs new guard. Its not just a west coast rivalry, but the West Coast Rivalry. Buckle up Ducklings, the Ten Year War has just begun.